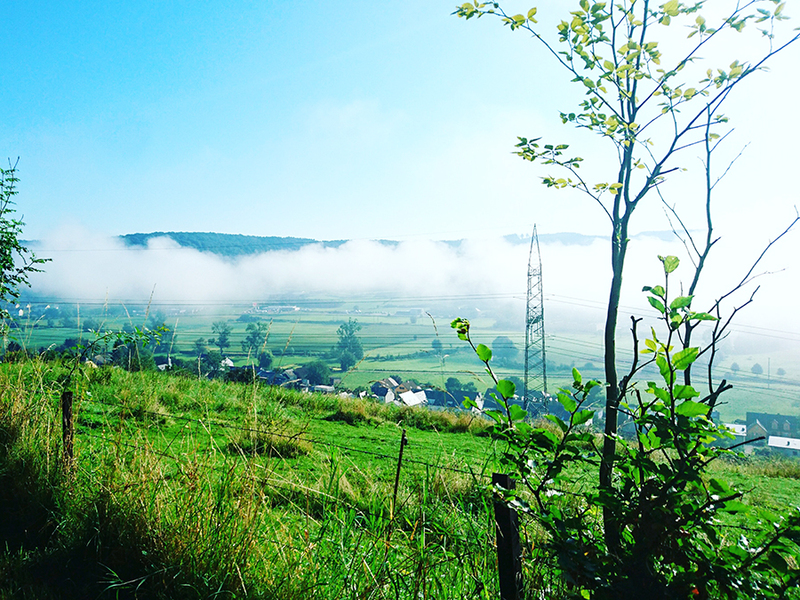 If there’s one thing I love about living here in Luxembourg it’s the beautiful colours of Autumn when the forests turn from green to red, yellow and brown, and as long as the sun is shining it’s an absolute pleasure to drive through the leafy forest roads or walk with the dog first thing in the morning. 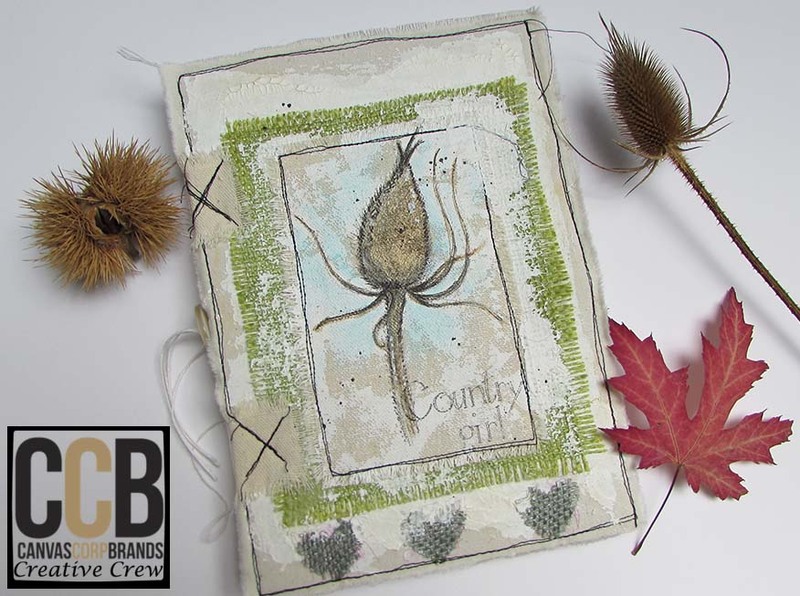 From today some of the Canvas Corp Crew are going to be blog hopping and showcasing projects inspired by Autumn. 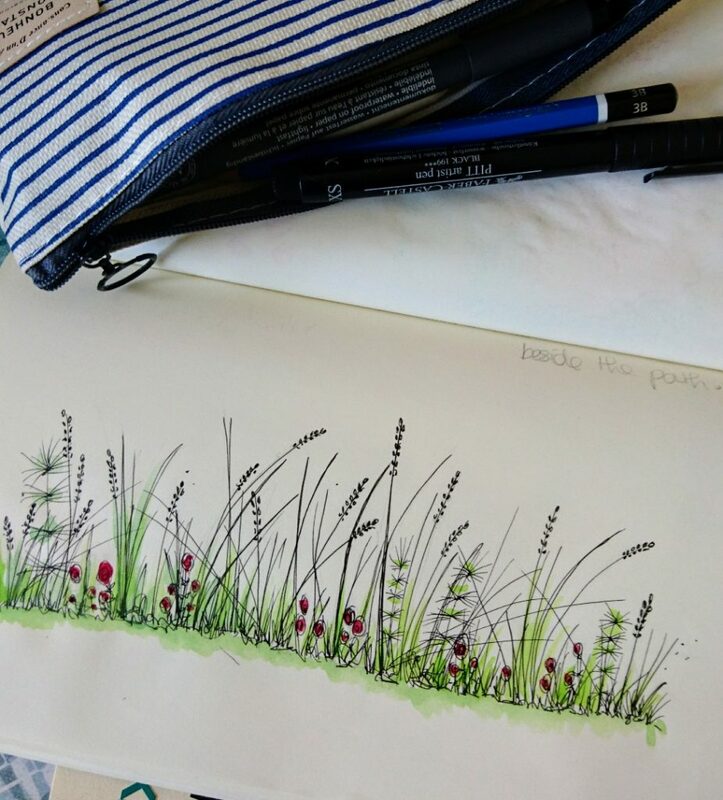 It’s quite normal on my morning walks to pick up leaves, twigs or interesting things I find along the way and a lot of these end up in my inspiration jar for sketching at a later date. 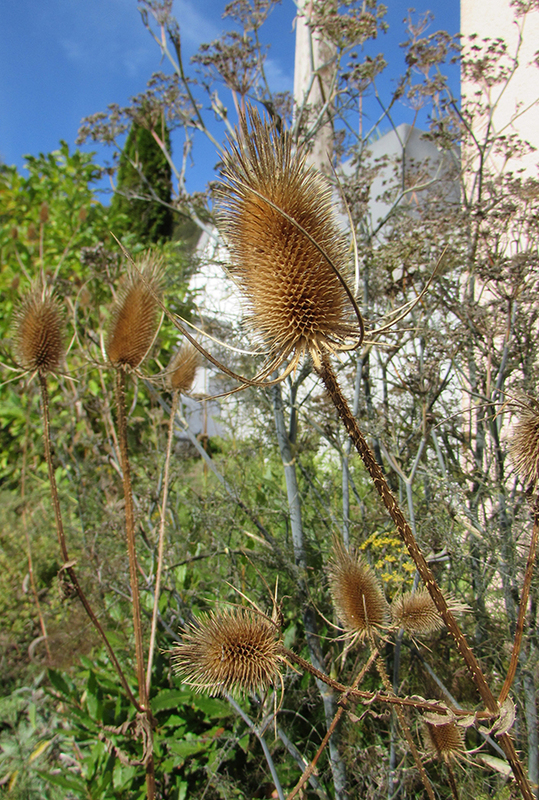 I was inspired to create by the teasle seed heads outside my studio window which I leave standing throughout the winter to give a nice structure to the garden as well as feeding the birds. I thought it was about time I added some sketches of my nature finds in a journal and of course I had to make one for the purpose. 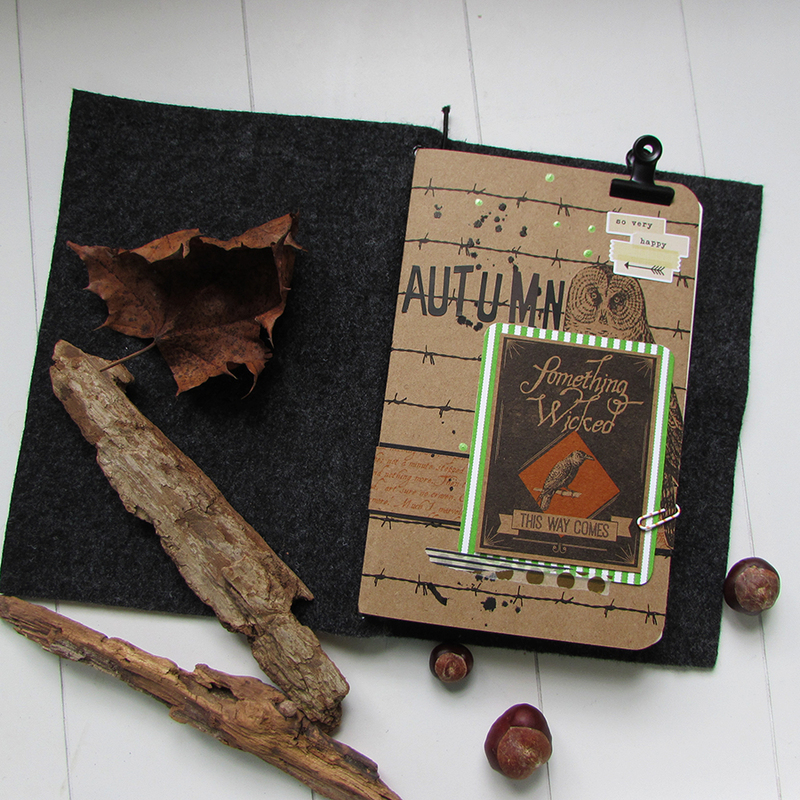 So here it is, an Autumn-inspired junk journal for sketching the things I’ve found on my morning forest walks with Cooper. I’ve painted on a piece of Stretched Natural Canvas cotton and given a mixed media finish with paints, gesso and texture paste. I also added a pretty piece of Avocado Burlap along with some Grey Burlap die cut into hearts. 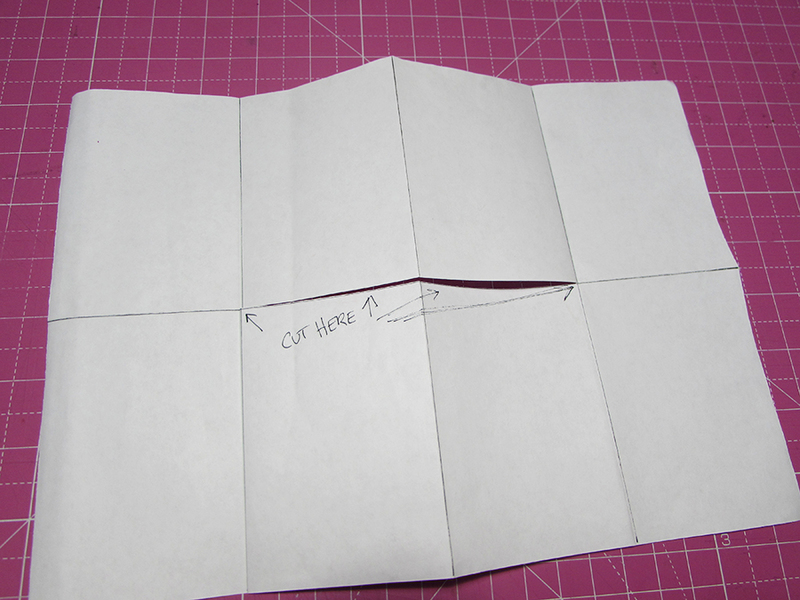 The hand-stitched binding I’m thrilled with only because it’s tricky to make it look neat enough. Painting on canvas cotton is so satisfying and looks beautiful when it’s given a shabby chic treatment. 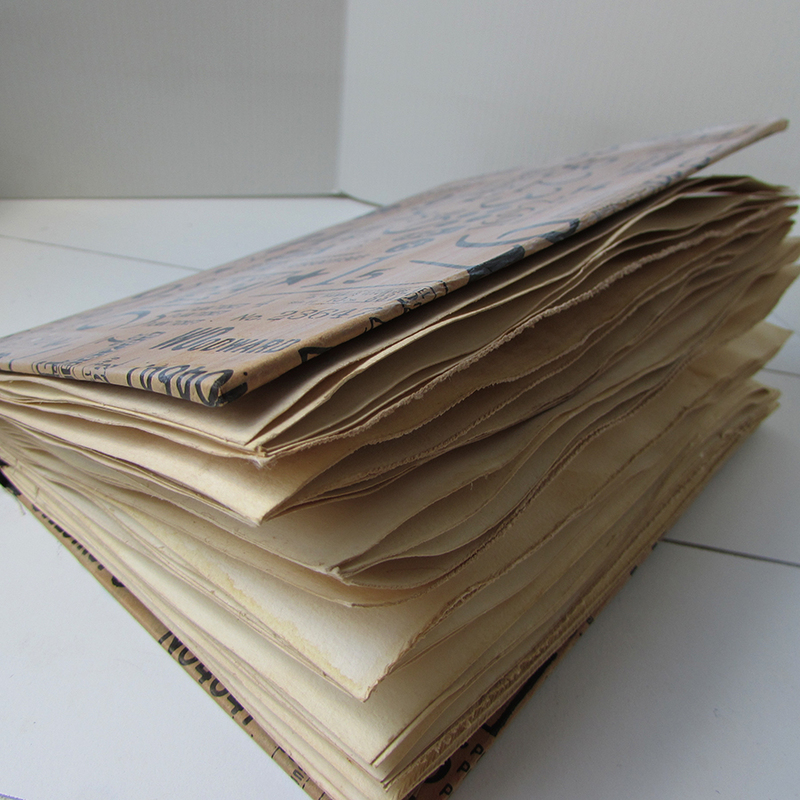 The inside has four signatures each with eight pages made from magazine paper, music score and plain old copy paper. 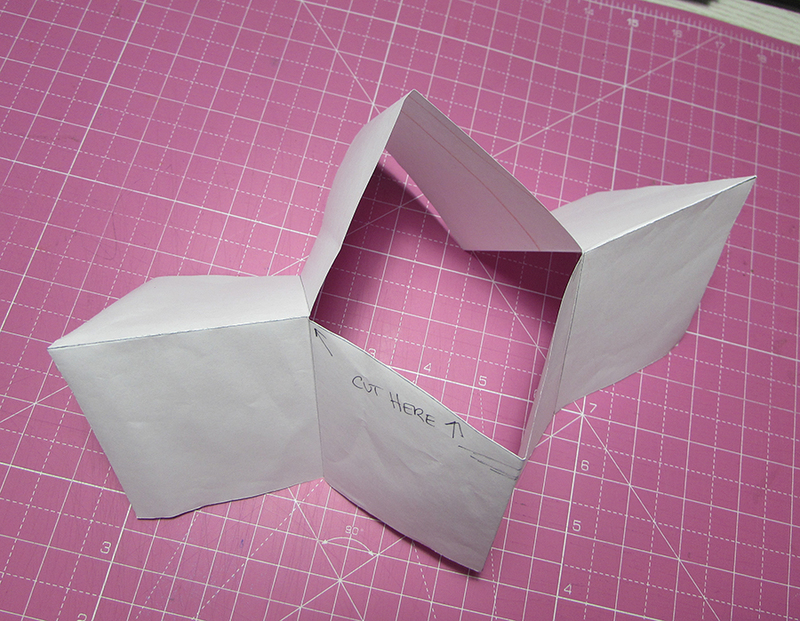 I did use kraft paper for each outer page just so it would look neat from the outside, but I look forward to using these pages as much as the rest. So do have a “leaf” through each blog (that was truly terrible) to discover their Autumnal projects and don’t forget to leave them some love as you go. 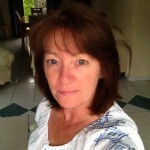 The next on the list is Christine Santos. I’ll be back soon with another blog post but for now happy hopping. You know that thing when making a card seems a little bit mean to be saying “thank you for inviting us to stay for the weekend” or “we had a great time at your party” and it’s a bit late to be making a whole mini album which you know they’d love but you just don’t have the time? Well I think this might just hit the brief in terms of more than a card but not quite a whole album. It’s my old favourite the one page mini book, the one where I start off with one big sheet of paper, in this case it was an A3, and coloured the background with a marbled effect using spray and folded it up into my mini album. 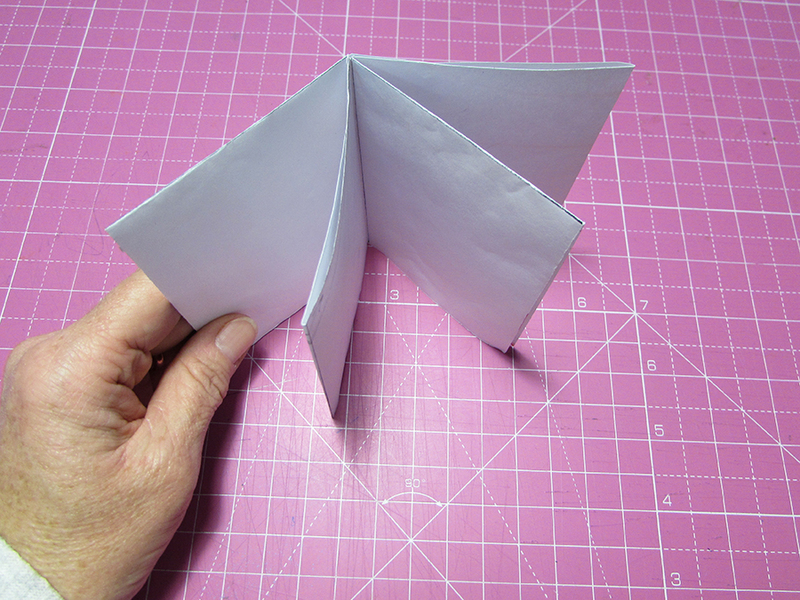 Here are a few photos which hopefully show the folding technique. 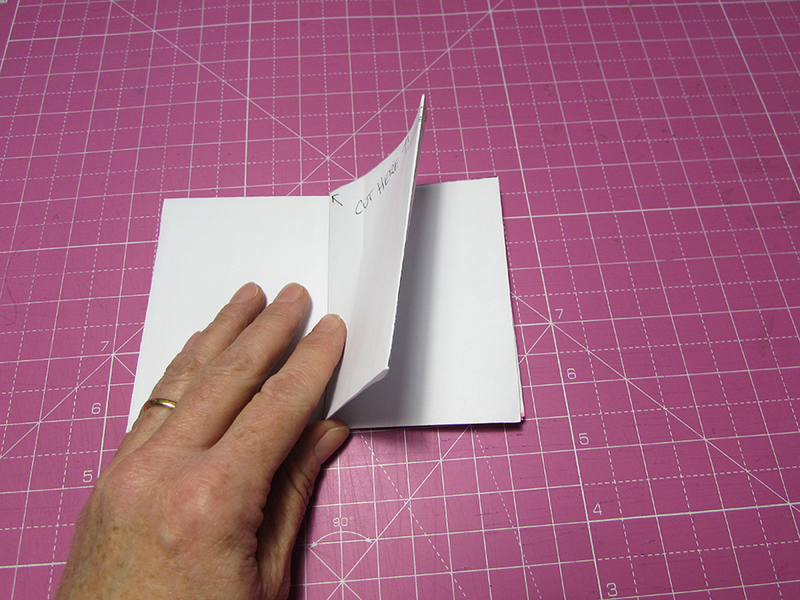 The resulting book has 8 A6 sized pages so enough for a few photos and some writing. 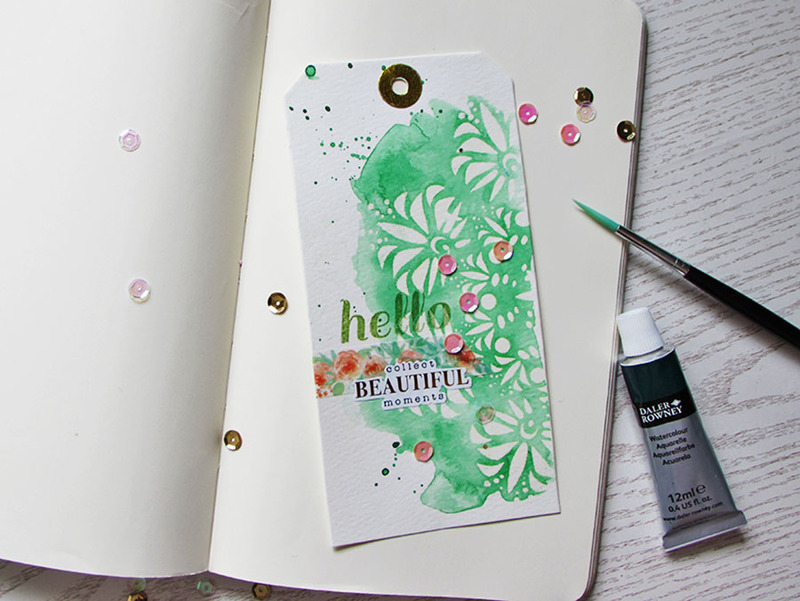 I wrote a little tutorial for the marbled background which you can see on the web site of Canvas Corp Brands here by clicking this link. 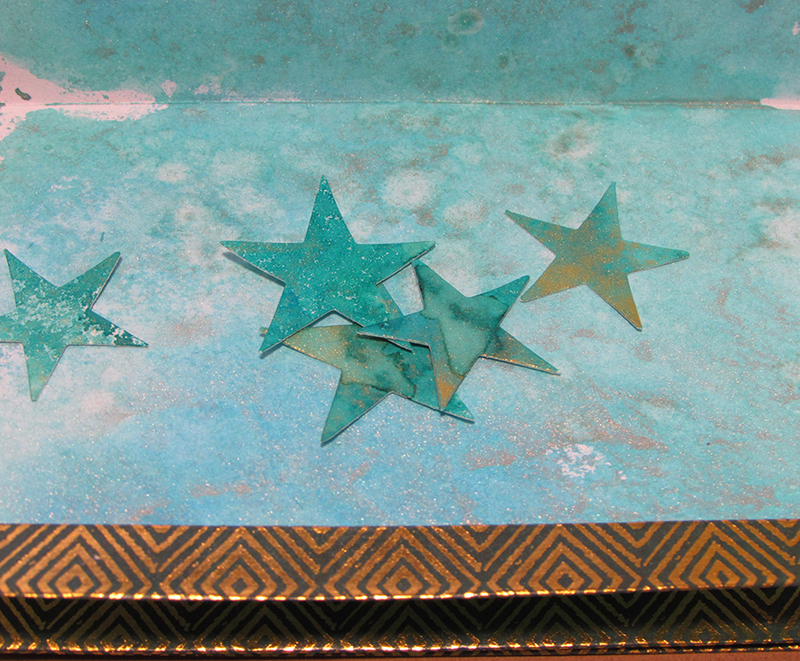 As you can see I created enough coloured paper to use for die cutting the stars. I hope you try it for yourself. If you do I’d love to hear. Two projects, two different styles and two very different finishes are on my table today. 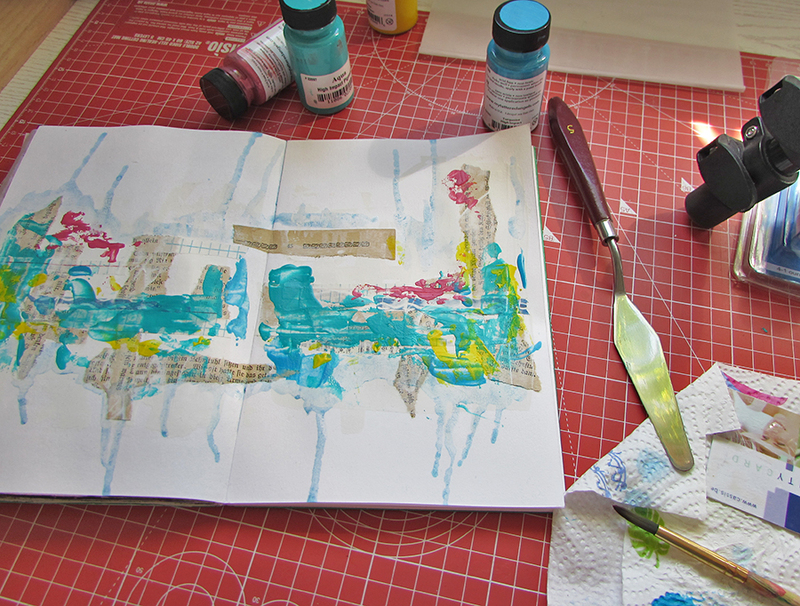 I’m flitting about between the two here, while one dries I add something to the other one. It’s a bit mad to be honest but while the ideas are in my head I have to do it otherwise it’s gone. This top one is in the Traveling Art Journal for Canvas Corp Brands and I’m truly happy with how it’s progressing. Some acrylic paints, some watercolour and a bit of collage is all I’ve done so far. 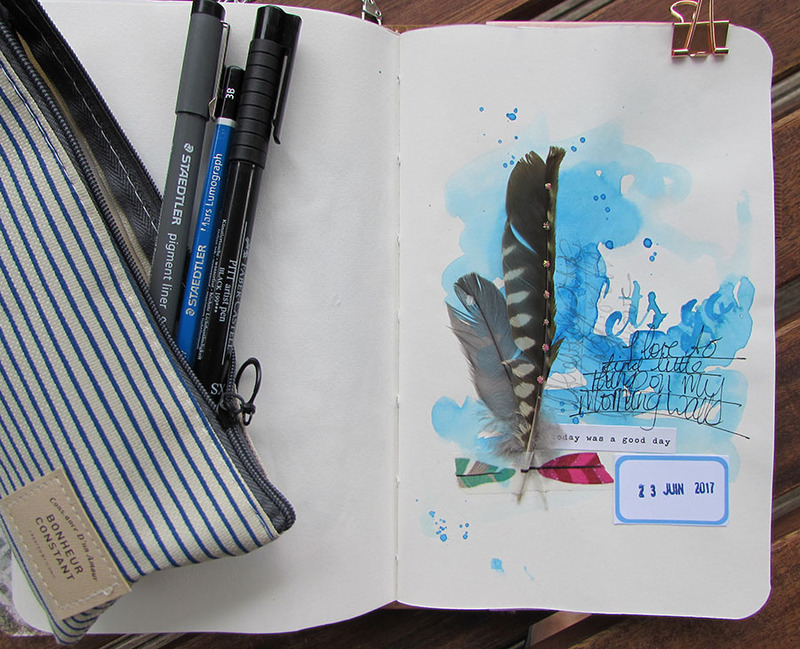 I’m finding at the moment that my journal pages aren’t as dark as they used to be and I’m leaving alot more white space. Maybe it’s a phase. 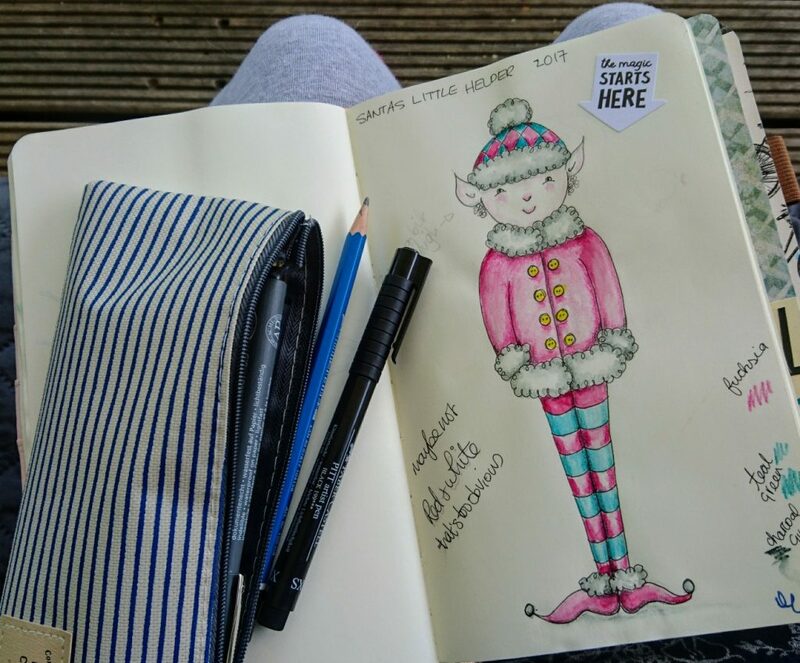 On the other table and in complete contrast I’ve got my sketchbook open to finish off a sketch I started yesterday in the garden. If you were to look at the sketch and the garden side by side you’d see I’ve enhanced the flowers big style. The border isn’t looking quite as blooming as that! After a cold and wet couple of weeks it’s gone into Autumn mode with several of my plants going totally to seed. It’s my sketchbook and I can do what I want in it, right? We’re getting ready to go off to Ireland at the end of this week but I’ll be back with a quick post on Friday. It’s been a crazy couple of weeks here. 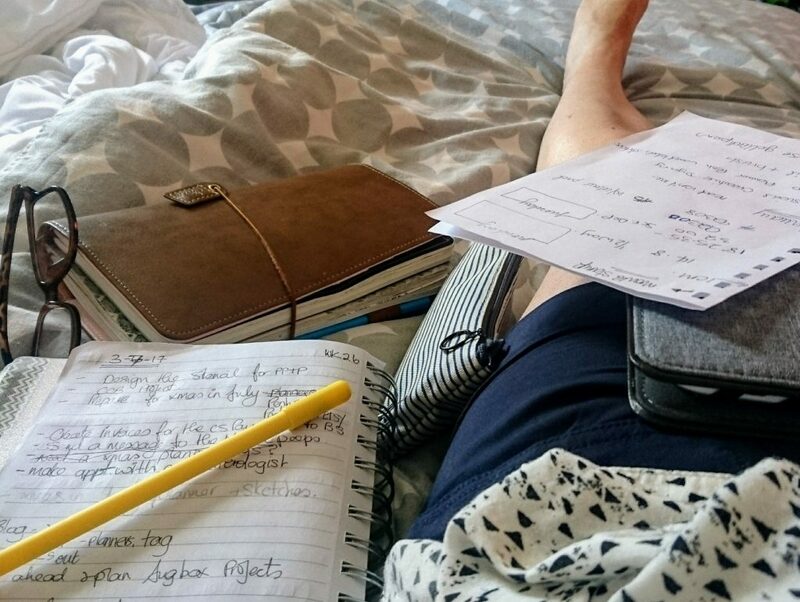 I went into hospital for a small, quick operation by laparoscopy and came home feeling sore, more than a bit tired and as bloated as a whale but spending time in my pj’s with my feet up had some advantages. 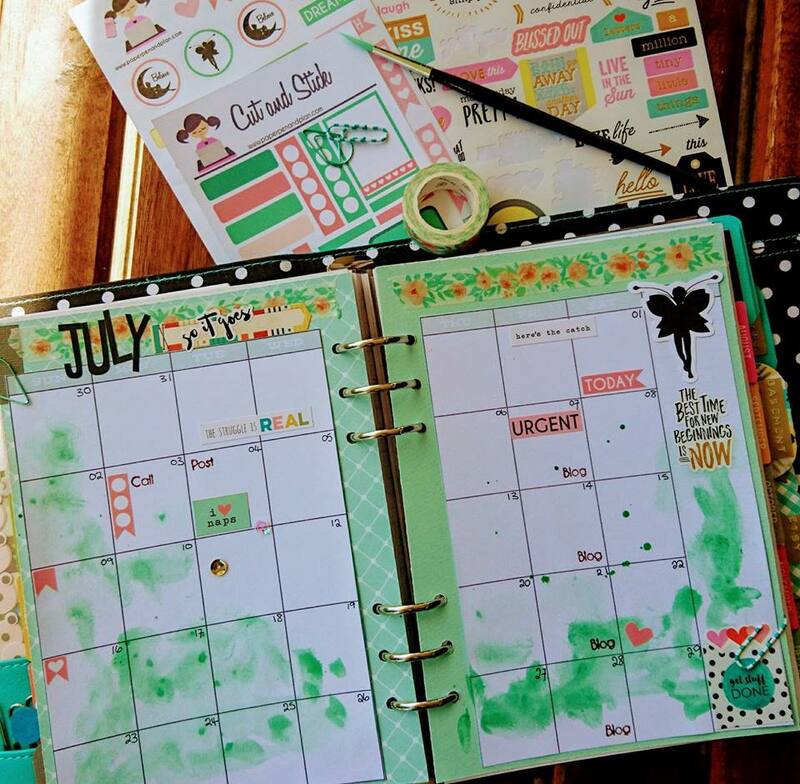 I had lots of time to sketch and catch up with my planners and journals. 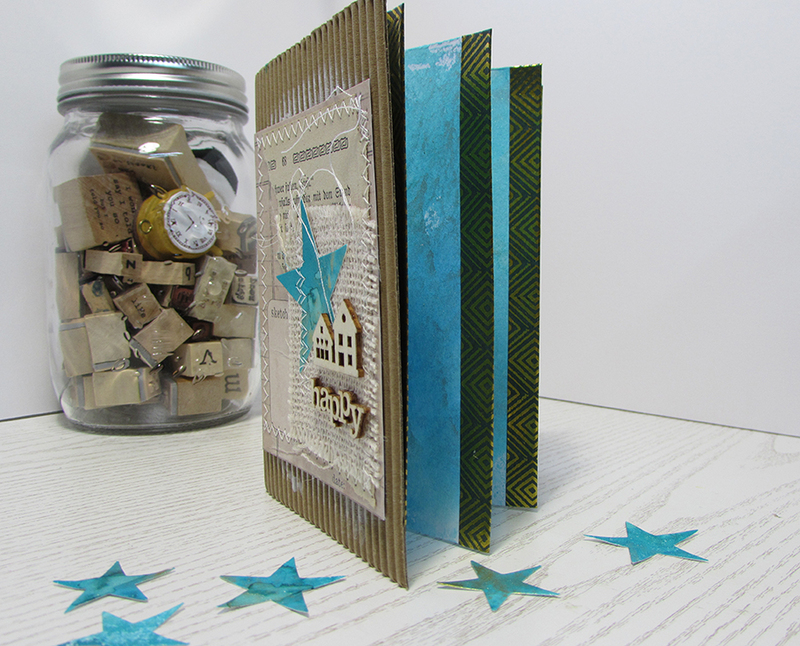 As it’s July already I even made a start on my Christmas designs too. You can never be too early!! Here’s one which needed finishing off. Just as I arrived home my parcel from PaperPenandPlan was waiting for me. This months box is all about Quotes and the colours are beautiful and soft with mint greens and soft pinks. 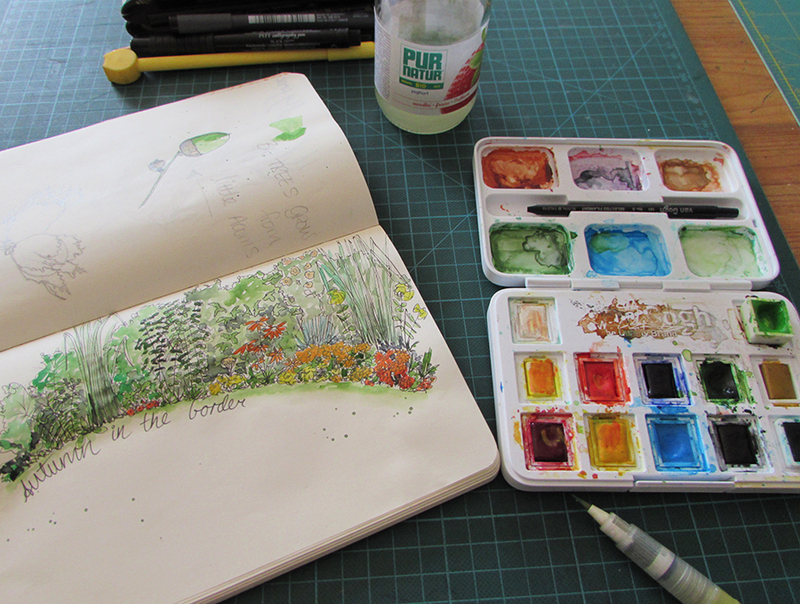 As the box contains a tube of paint and a brush I’ve ended up watercolouring everything which doesn’t move, including the pages of my Carpe Diem. The paint is very highly pigmented and to be honest it could have done with being watered down a bit more but once I’ve added more to my calendar I’m sure it won’t be so ‘in your face’ so to speak. I love the ephemera pack which contains some gorgeous die cut fairies. 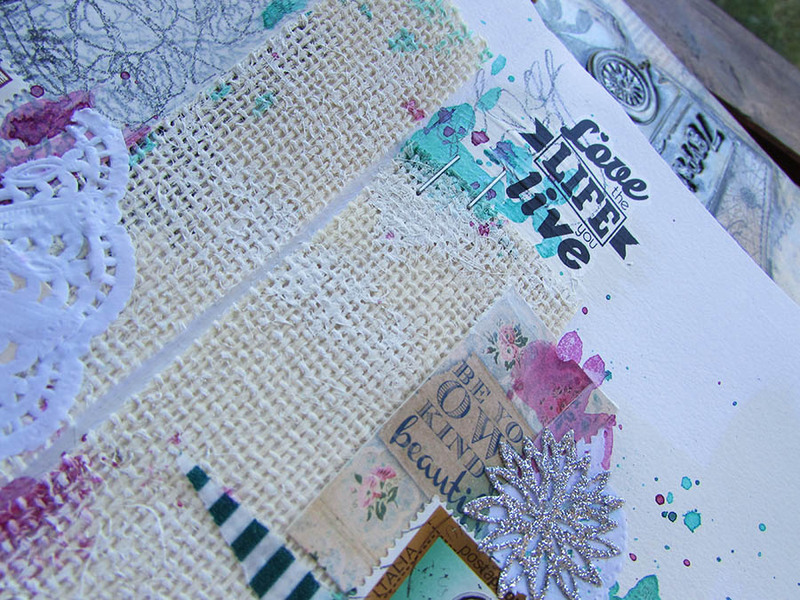 I didn’t get to show you my pages for the June Traveling Art Journal with Canvas Corp Brands. I think this is my favourite to date. Have a good weekend all and I’ll catch up again next week. 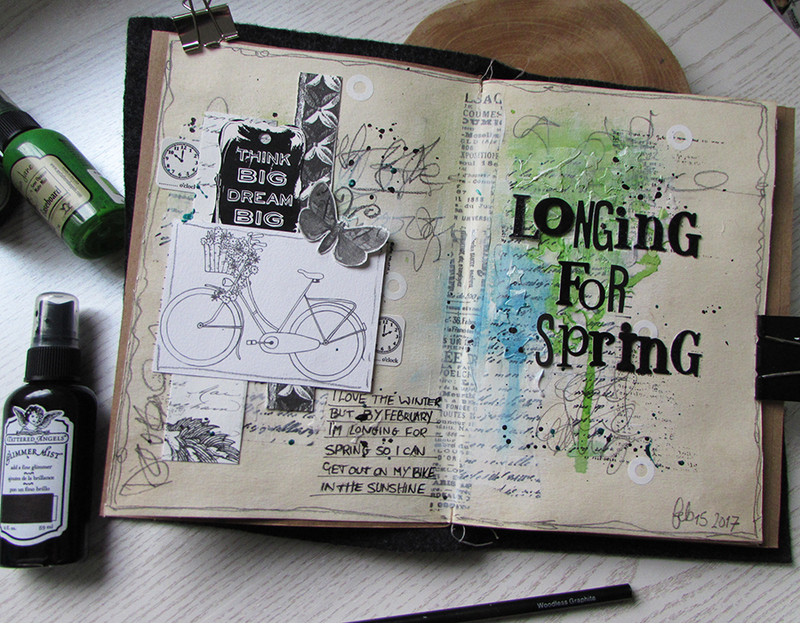 It’s time for another spread from the Traveling Art Journal project for Canvas Corp Brands. 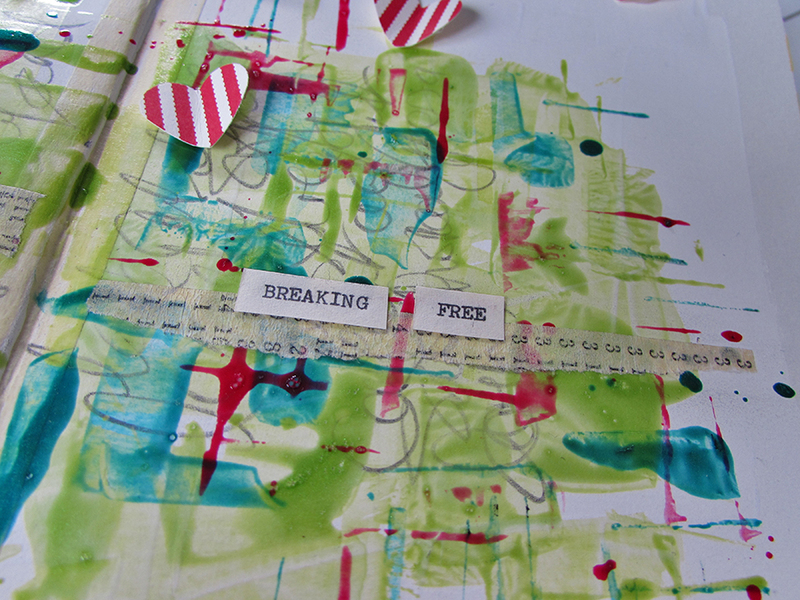 My theme for this month is “Breaking Free” dedicated to all those people struggling with an illness and starting to feel more like their old selves again. For me that was anaemia and after six months of tiredness and exhaustion I finally feel like I’ve the energy to get out there and do what I want. 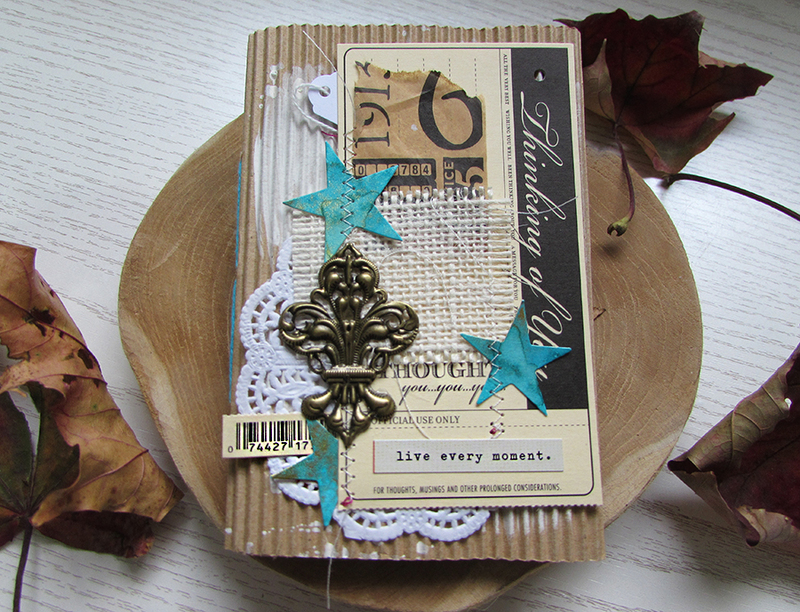 Using my Glimmer Glazes from Tattered Angels in my favourite colours, I painted on the colour in patches then used the edge of an old store card to print lines. I splattered a few random dots across the page to add even more movement to the piece. 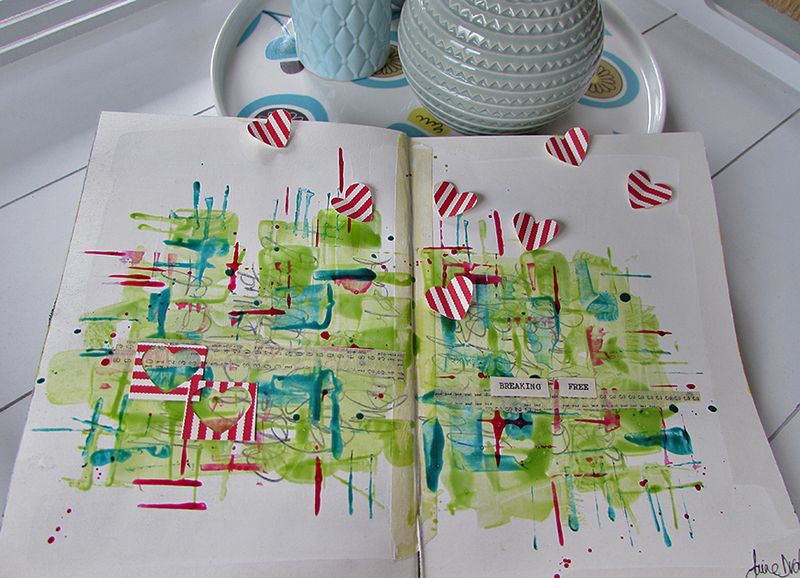 The little hearts are given a bit of a 3D treatment to fly free from the page. To see more of this months pages from the other Travelers go to the CCB blog here. I’ll be back later on in the week with more inspiration. 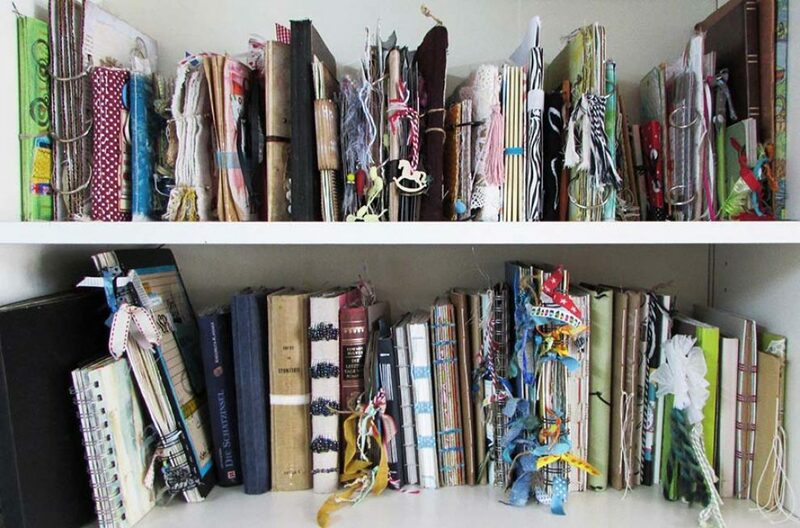 This past year my art Journals have been left on the shelf while I concentrated on other things. 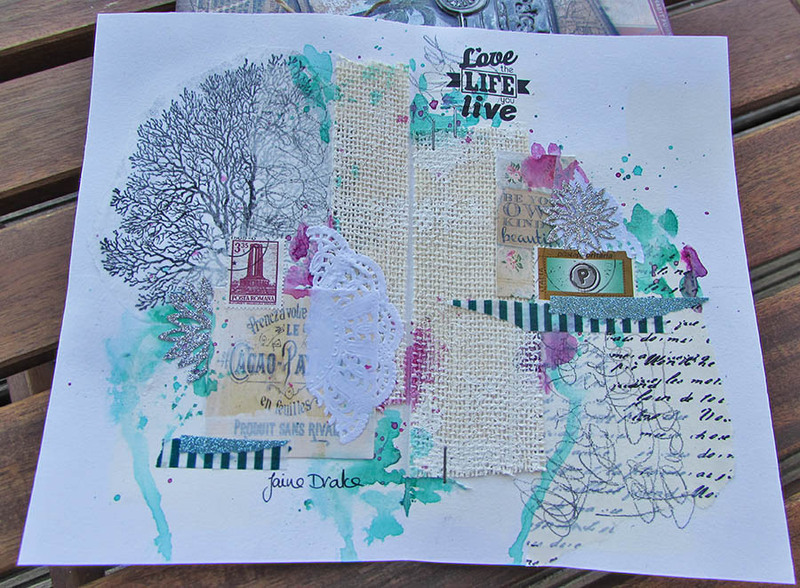 I didn’t know how much I missed it until I got involved with a journal project with Canvas Corp called The Traveling Art Journal. Over the course of a year, a group of us are sending out our journals to friends all over the world where they’ll be worked in before being sent on their journey and finally arriving back home to the owners. Along the way it’ll make a fantastic monthly project on the Canvas Corp web site for anyone who wants to follow our progress. 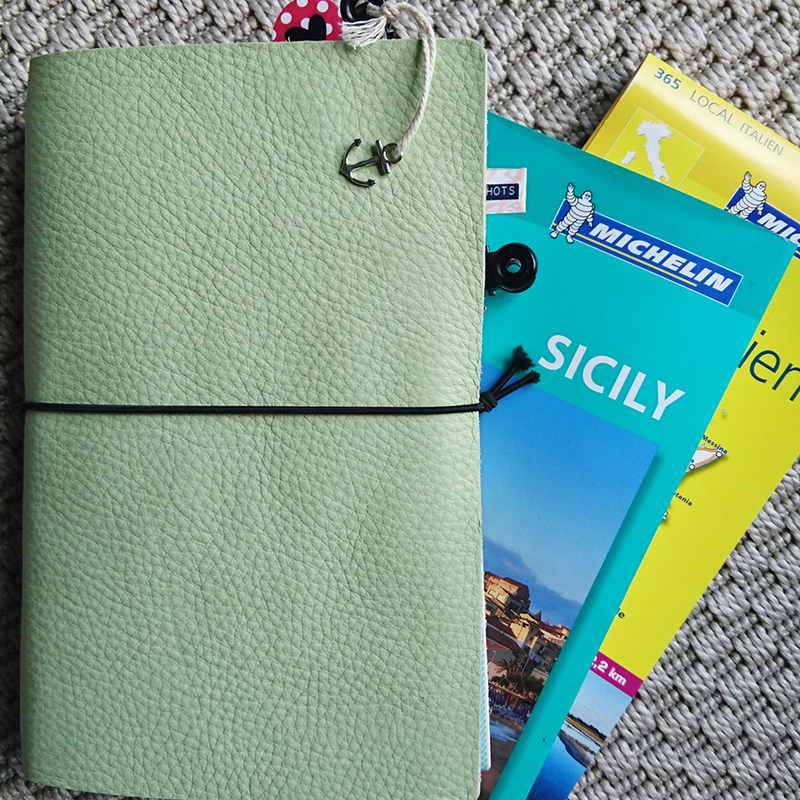 For my journal I chose to make a Travelers Notebook style binding with two simple hand sewn books inside. The pages are watercolour paper so should stand up to most mediums and as the paper was very white and stark, I tea dyed every page to give it a bit more character. 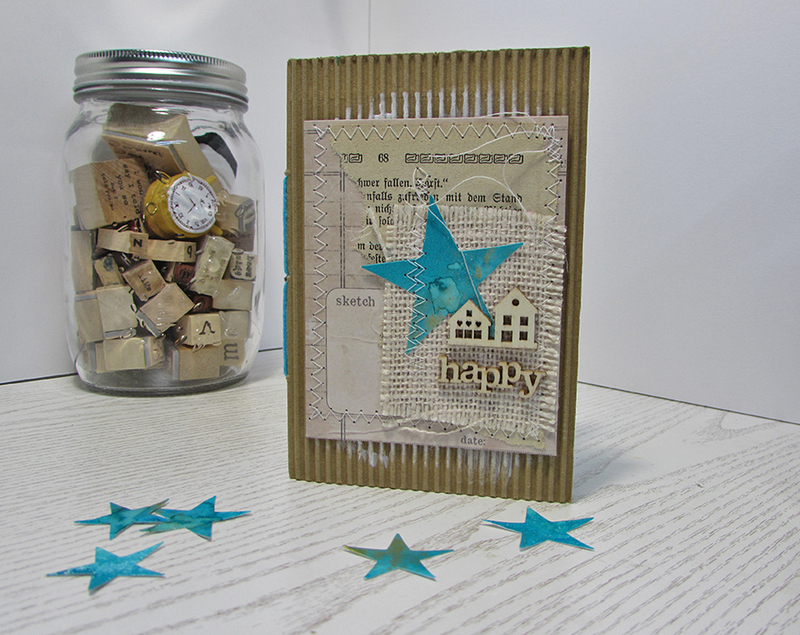 I used, texture paste, inks and stamping to create a background and collaged some papers and images on top. 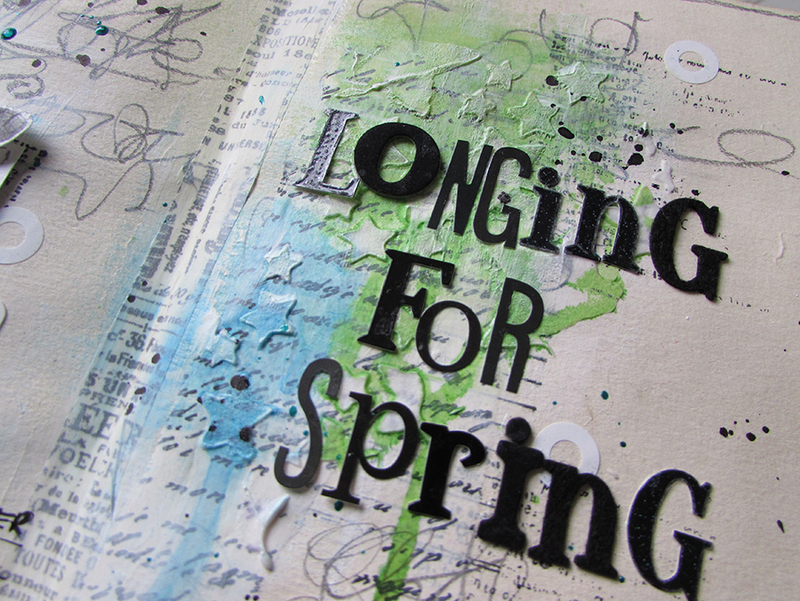 At the time of creating the page, the weather was anything but Springlike so I added the title to reflect how I was feeling while I was working. 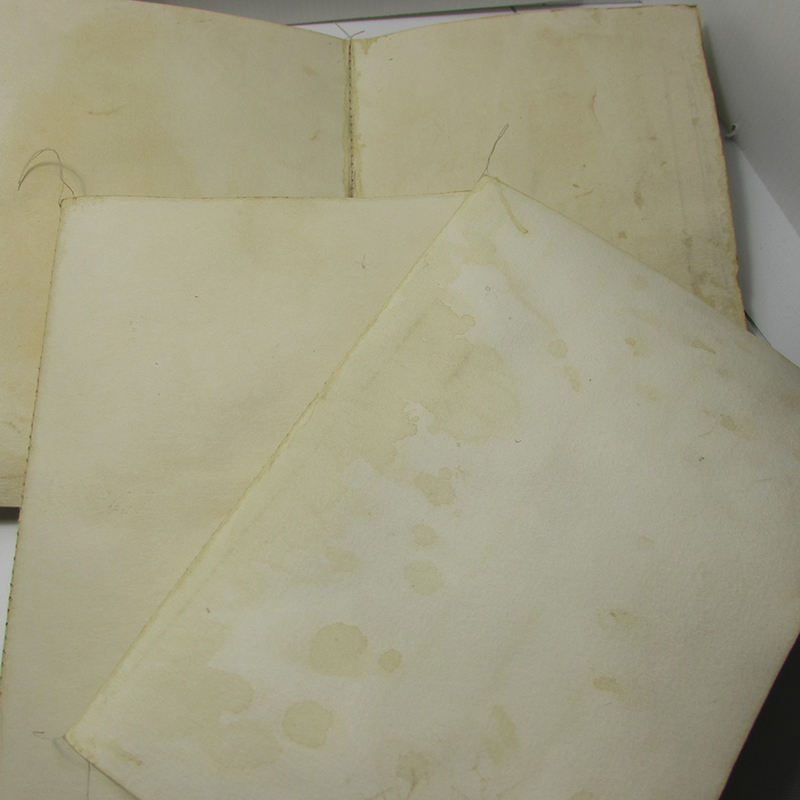 These are the tea dyed pages before putting them together in the journal. I loved how they came out, it made them look so old. 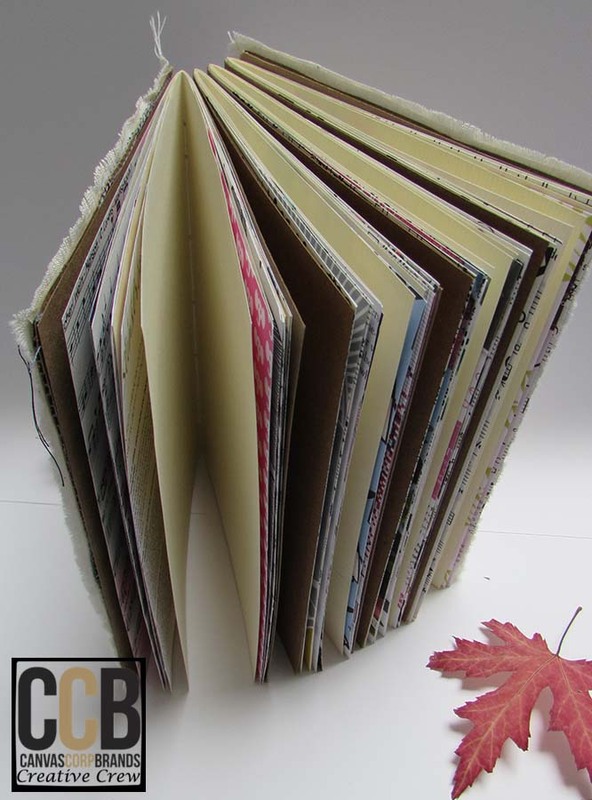 If you want to see how everyone else created their journals and pages then go to the Canvas Corp web site here and follow along monthly to see how it’s going. 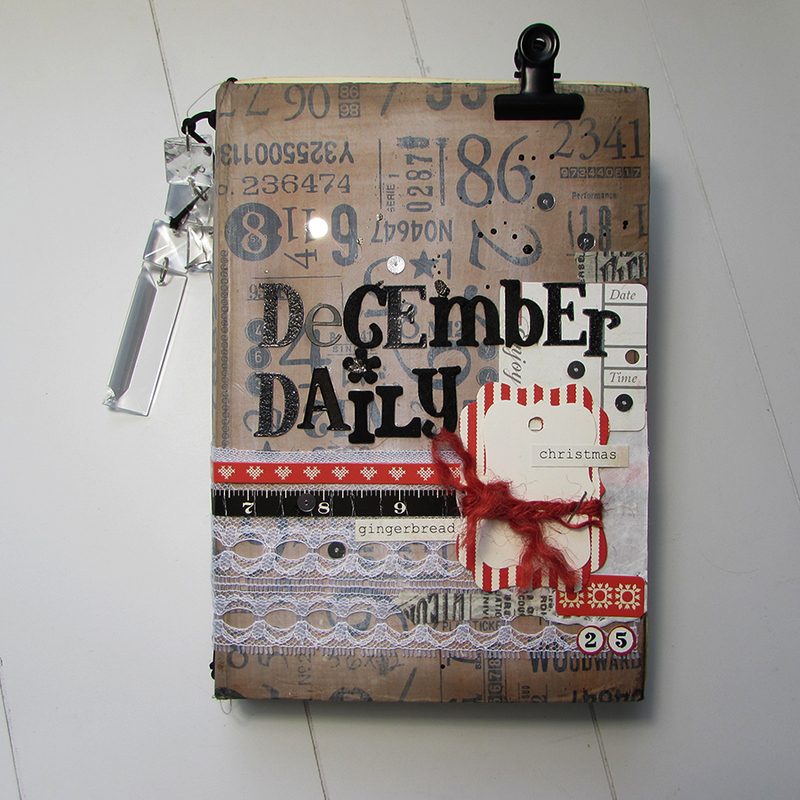 Who documents December in a special journal? 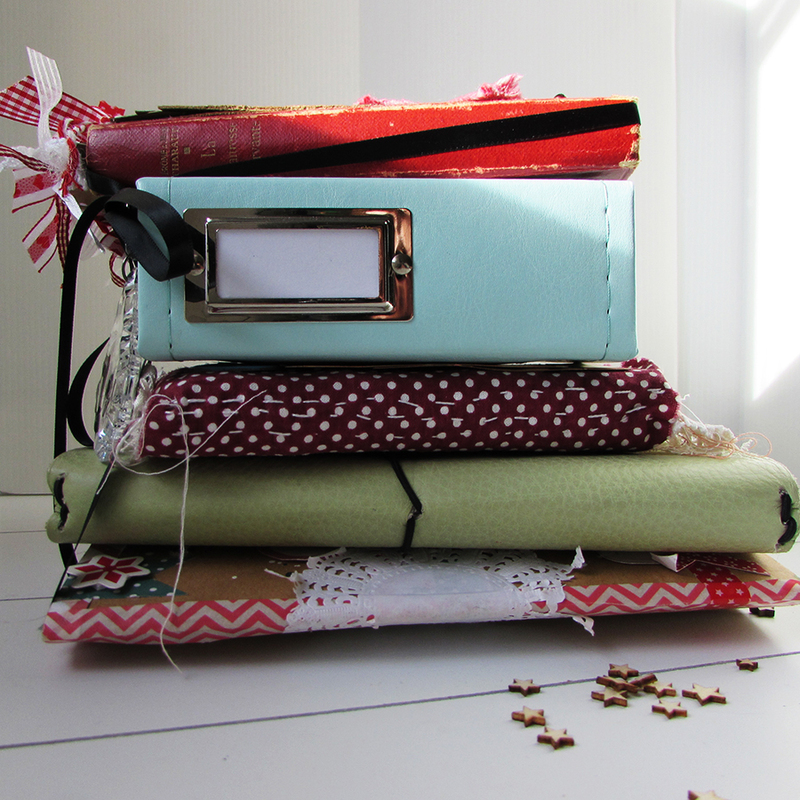 This random pile is a few of my journals from past years including an altered book, fabric, faux dori and a mini file folder for Instagram photos, I’ve tried them all. 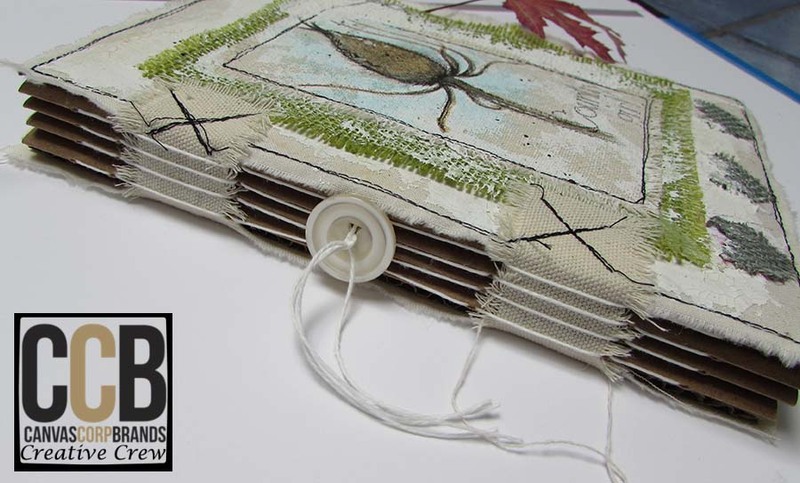 This year I’ve decided to go once again with an altered book but this time I’ve taken the pages out and used only the cover. 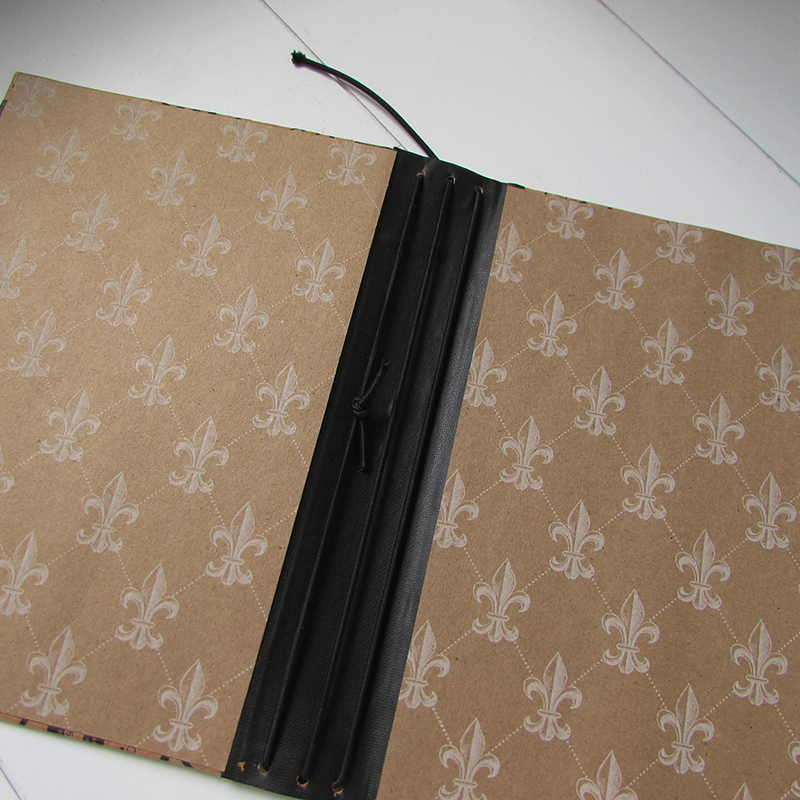 I thought I’d go with an elastic style binding to hold the pages in which will enable me to reuse the cover next year. I used watercolour paper for the inside pages as I can paint, glue and do almost anything I feel like to them without them falling apart and just as a bit of an experiment I decided to tea dye the paper for a bit of a vintage feel. Oh boy I had no idea that it would make me so happy once the pages were dry. To be honest, I really should have done it before I sewed the pages together as it was a bit of an afterthought but I was so happy with the colour, the staining and even how the pages curled and buckled once they’d dried. I was positively squealing with delight. 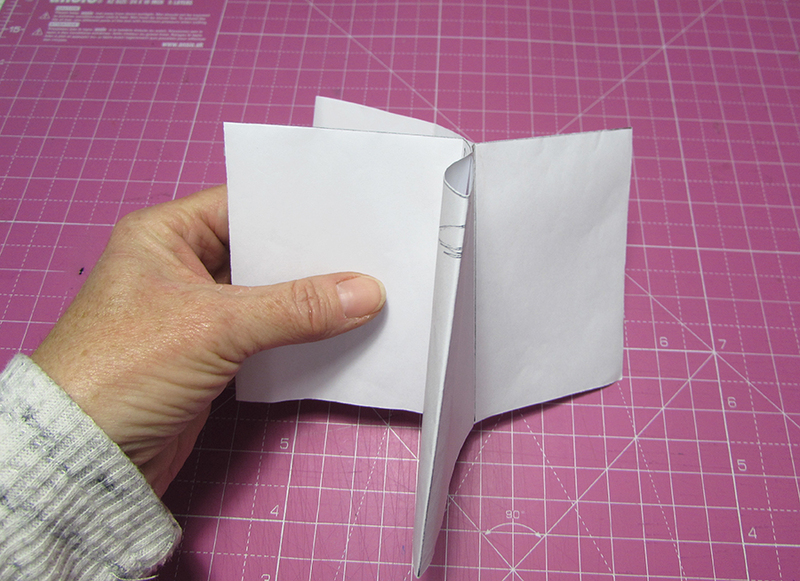 I’ve three books or signatures of five papers each sewn together on the sewing machine and these fit through the elastics in the cover. 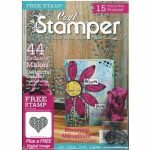 The cover has been decorated with firstly some Collage tissue paper from Canvas Corp along with some lace, tags, stickers and a few sequins. I am more than happy with it and can’t wait to dive in. I’d love to know if you’re going to document December in any way? Let me know. Happy Friday From The Studio And A Bit Of A Throwback. Today I thought I’d go back and share a project which I made a while back for Canvas Corp but which is still one of my favourite pieces. 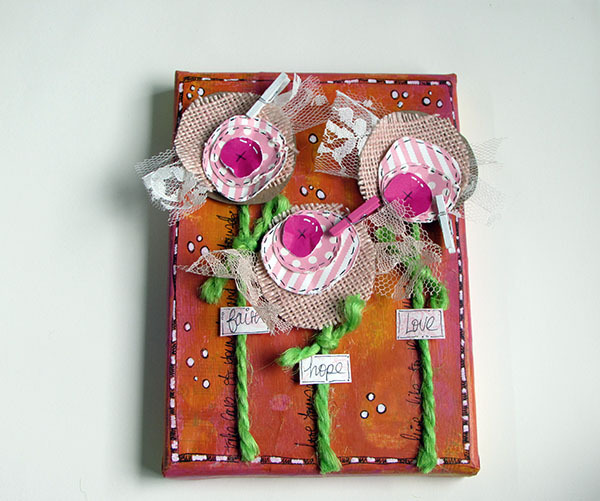 It was made using Tattered Angels High Impact Paints as a background and offcuts of paper and fabric for flowers.